Explanation: On the upper right, dressed in blue, is the Pleiades. Also known as the Seven Sisters and M45, the Pleiades is one of the brightest and most easily visible open clusters on the sky. The Pleiades contains over 3,000 stars, is about 400 light years away, and only 13 light years across. Surrounding the stars is a spectacular blue reflection nebula made of fine dust. A common legend is that one of the brighter stars faded since the cluster was named. 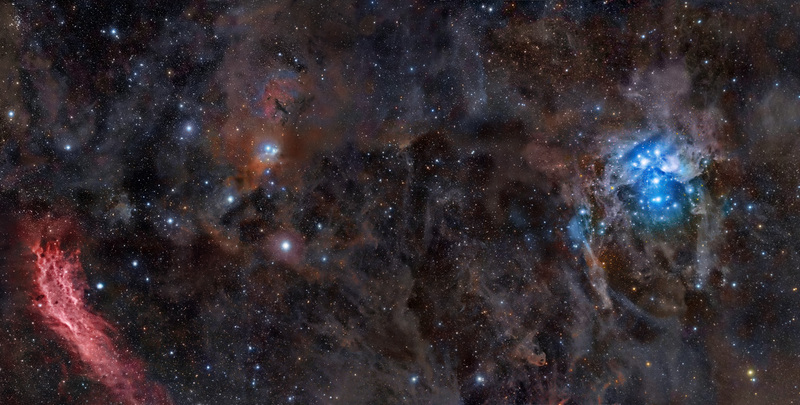 On the lower left, shining in red, is the California Nebula. Named for its shape, the California Nebula is much dimmer and hence harder to see than the Pleiades. Also known as NGC 1499, this mass of red glowing hydrogen gas is about 1,500 light years away. Although about 25 full moons could fit between them, the above wide angle, deep field image composite has captured them both.